The public's perception of latex paint has been anything but constant over the past six decades. At times, latex paint has been seen as a blessing, and at other times, it has been a bombshell. Manufacturers have proved that latex paint is here to stay. 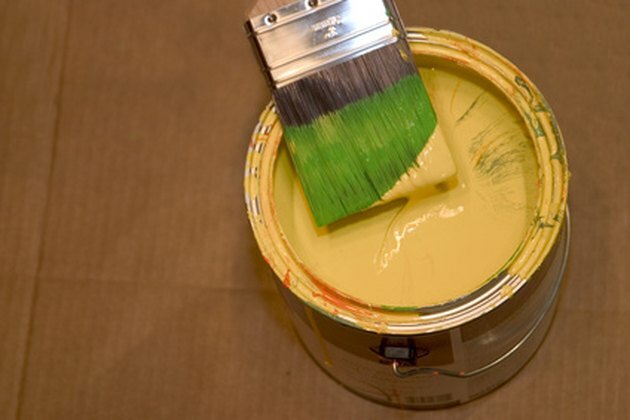 Before latex paint was invented, oil-based paint was commonly used, and most of the oil-based paints contained lead. According to the U.S. Consumer Product Safety Commission, if your home was built before 1960, most likely heavily-leaded paint was used to decorate the interior surfaces. The Environmental Protection Agency (EPA) estimated that 64 million homes contained lead-based paint in 1990, but increased public education about the dangers of lead-based paint has brought that number down to 24 million homes as of 2008. Latex paint, which did not contain lead, was the paint of choice after 1960; however, the Consumer Product Safety Commission recommends conducting a lead test on any home built before 1980, just to be safe. William and Nancy Young, authors of a book entitled "The 1950s," assert that the do-it-yourself mentality about home improvement became increasingly popular in the middle of the 20th century. Homeowners were drawn to latex paint because any paint that accidentally ended up on a hand or arm could be removed with just soap and water. At the time, latex paint was still a new product. According to the American Chemical Society, Sherwin-Williams released Super Kem-Tone latex paint in the late 1940s. By 1953, Super Kem-Tone was being advertised in popular publications like "Life" magazine. In these full page ads, a great deal of emphasis was placed on easy cleanup. Though latex paint seemed like a godsend, it did expose many people to an unsafe amount of mercury. As of 1990, when "The New York Times" reported that the EPA was banning the use of mercury in interior latex paint, approximately 30 percent of the interior latex paint on the market contained mercury. Even though mercury has been removed from the ingredient list, the widespread use of latex paint has a hand in creating air pollution and exacerbating respiratory conditions like asthma, thanks to a coalescent in the paint that evaporates during the drying process. However, in June 2005, Dr. Michael Van De Mark, a University of Missouri-Rolla chemist, showed manufacturers a way to make latex paint better for the environment. Instead of mixing glycol with a chemical-based coalescent, Van De Mark mixed the glycol with a derivative of a plant-based oil. A number of other ways has catapulted latex paint to the forefront of the green movement. For example, Amazon Environmental Inc. has made a business out of recycling latex paint. The company basically gathers leftover paint from a variety of sources, mixes it together, filters it and sells it by the gallon. And whenever you feel inclined to remove your latex paint, biodegradable products like Motsenbocker's Lift Off #5 and Peel Away Smart Strip can be found at your local home improvement store.